MOBILE, AL – A total of 41 Mobile area natives signed with college teams Wednesday on National Signing Day. 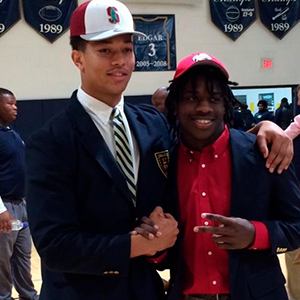 Eleven schools in the Mobile area are represented in college signings this year. The school with the most signees this year was Blount High School with 10, and Daphne High School was close behind with eight signees. Four players signed with the University of South Alabama, and one player signed with the Crimson Tide as a preferred walk-on. Below is the full list of players from Mobile schools. Colin McCants (Defensive End) signed with the University of North Alabama. Michael Kidd (Defensive Back) signed with the University of West Alabama. Frank Hurst (Defensive Line) signed with Millsaps College. Chase Overstreet (Tight End) signed with the University of Cumerlands. Cade Stamps (Linebacker) signed with the University of Cumberlands. D.J. Lamkin (Defensive Back) signed with Millsaps College. Eli Powell (Quarterback) signed with Faulkner University. Tyler Jemigan (Offensive Line) signed with the University of South Alabama. Jarious Bush (Offensive Line) signed with Southeastern University. Kyle Cass (ATH) signed with Alabama State University. Jacoby Davis (ATH) signed with Alabama State University. Ray Hunt (Offensive Line) signed with Southeastern University. Jamarcus Powe-Mauldin (Wide Receiver) signed with Huntsville Prep. Charles Mickles (Defensive Line) signed with Huntingdon College. Joshua Norwood (Running Back/Linebacker) signed with Huntingdon College. Tashaon Pettway (Defensive Back) signed with Sterling College. Trajan Pugh (Running Back) signed with the University of South Alabama as a preferred walk-on. Collins Woods III (Wide Receiver) signed with the Navy College. Jonathan Orso (Defensive Tackle) signed with Alcorn State University. Rashad Yelding (Defensive End) signed with Lenoir-Rhyne University. Ty Reynolds (Linebacker) signed with Rocky Mountain College. Chance Newman (Quarterback) signed with Coffeyville Community College. Jack Cushman (Defensive Line) signed with Butler Community College. Marese McBride (Defensive Line) signed with Gulf Coast State University or East Central Community College. Hunter McLaurin (Offensive Line) signed with Millsaps College. Joseph Santini (Offensive Line) signed with the University of Cumberlands. Ryan Love (Offensive Line) signed with Missouri Baptist University. Wes Baumhower (Linebacker) signed with the University of Alabama as a preferred walk-on. James Harris (Running Back) signed with the Naval Academy. Kaleb Jackson (Defensive End) signed with the Air Force Academy. Chris Armstrong (ATH) signed with East Tennessee State University. Mahja Armstrong (Wide Receiver) signed with Union College. Rett Files (Quarterback) signed with the University of North Alabama. Timontre Graham (Linebacker) signed with Jackson State University. Orlando Smoots (Defensive Back) signed with Millsaps College. Dwan James (Running Back) signed with the University of South Alabama as a preferred walk-on. Eric Garror (Defensive Back) signed with the University of Louisiana at Lafayette. Bryan Hill (Running Back) signed with Tuskegee University. Trey Simpson (Offensive Line) signed with the University of South Alabama as a preferred walk-on. Oakley Coleman (Wide Receiver) signed with Delta State University. Khalil Nettles (Running Back) signed with Huntingdon College. For more, listen to Prep Spotlight with Randy Kennedy, Pigskin Pete, and AL.com’s Ben Thomas Wednesdays at noon.